In 3 1/2- to 4-quart slow cooker, place chicken thighs. Top with onion, olives and capers. Sprinkle with oregano, salt, rosemary and garlic powder. 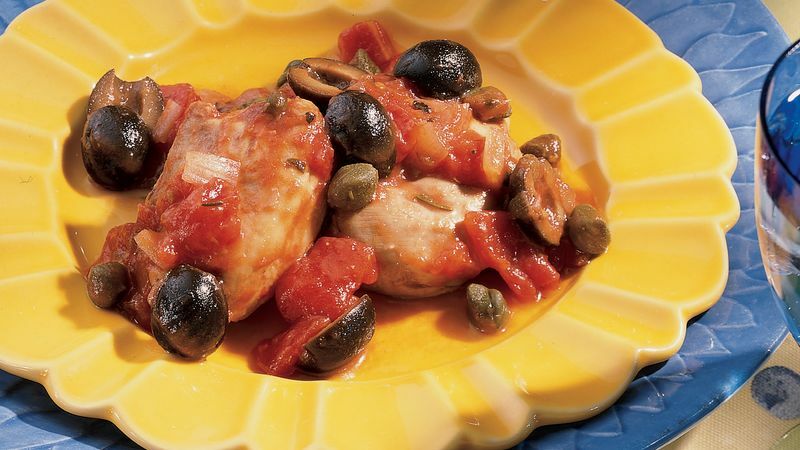 Pour tomatoes over chicken. Cover; cook on Low heat setting 7 to 10 hours. About 15 minutes before serving, with slotted spoon, remove chicken and vegetables from slow cooker; place on serving platter. Cover to keep warm. In small bowl, blend water and cornstarch until smooth. Stir into liquid in slow cooker. Increase heat setting to High. Cover; cook 5 to 10 minutes longer or until thickened. Serve chicken with sauce.